2019 is the Chinese Year Of The Pig and Eyecon Games are celebrating by releasing Pig’s Feast. This is a 25 payline slot that features plenty of tasty dishes and exciting features. The celebrations are continuing with a prize draw that’s taking place at Slingo.com and it’s sister sites. By playing on Pig’s Feast and a number of other popular Eyecon slots you have the chance to win up to £1000. 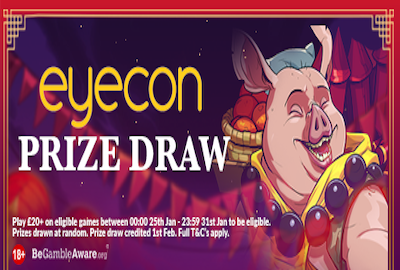 The Eyecon Prize Draw runs between the 25th and 31st January 2019. To enter this prize draw players need to wager on selected slots. These slots include Pig’s Feast, Fluffy Favourites, Temple of Iris, White Wizard and Sugar Train. Participants will receive one entry for every £20 wagered. There is no limit to the number of tickets a player can earn. Only cash wagering will count towards earning prize draws. After the promotion ends and the following will be won: 1 x £1000, 2 x £500, 10 x £100 and 20 x £50. Winners are chosen from all qualifiers across all participating brands. The prizes are cash and no wagering terms apply. 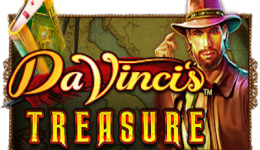 Players that don’t win a prize will receive bonus spins. The bonus spins will be credited on Friday 1st February by 6pm and can only be used on Pig’s Feast. Any wins from these spins will be paid as a bonus. This bonus comes with a x30 wagering terms. Note that further tems and conditions apply. Pig’s Feast follows in the footsteps of Fluffy Favourites, Irish Luck and Sugar Train. 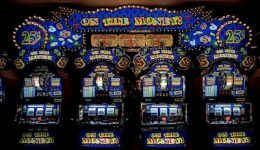 In short, they all follow Eyecon’s blueprint of creating simple but fun slots. That said, Pig’s Feast is visually leap years ahead of the likes of Fluffy Favourites. The images of spring rolls, bowls of rice, dumplings and other goodies are cartoon in style. However they do leave you salivating and reaching for Just Eat to call in a Chinese Takeaway! The features on Pig’s Feast include a Dumpling Pick, Fireworks Bonus and Free Games. Players can wager on Pig’s Feast from just 1p. However, by adjusting lines anc coin size it’s possible to increase the wager to £12.50. 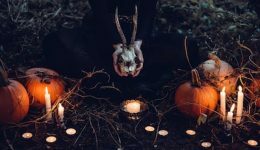 Whilst seasoned Eyecon Games players will stick with the familiarity of Fluffy Favourites, we think players will enjoy the snorting and piggy noises of Pig’s Feast. New Players Only. Varying wagering requirements apply: Slots 50x, Slingo 50x. Transfer cap: £100. Further T&Cs apply. 18+. begambleaware.org. New Players Only. Varying wagering requirements apply: Slots 60x, Slingo 60x. Max Bonus: £100. Further T&Cs apply. 18+. begambleaware.org. New Players Only. Varying wagering requirements apply: Slots 50x, Slingo 50x. Max Bonus: £100. Further T&Cs apply. 18+. begambleaware.org. New Players Only. 5 Free Games with No Deposit. 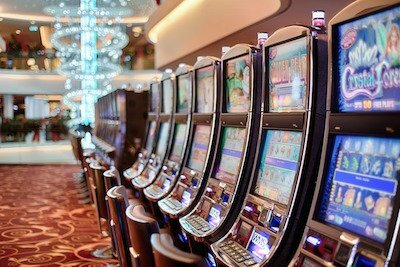 New customers to Bear Group Casino sites only. Wagering Slots x60, Slingo x60, Boom x8. 18+. begambleaware.org. Wagering terms and conditions apply. All details above were correct when published on January 30, 2019.